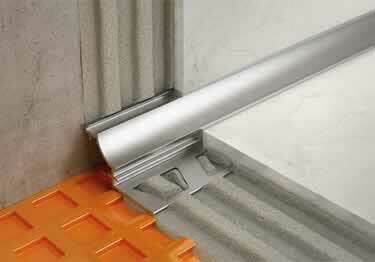 Schluter®- DILEX-AHK cove-shaped profile features a single trapezoid-perforated anchoring leg. Designed for use in transitions with limited movement like inside wall corners, countertops, backsplashes, and floor/wall transitions. Available in anodized aluminum or textured color-coated aluminum in 14 finishes, to fit your design needs. DILEX-AHK has a 3/8" radius to prevent accumulation of dirt, making cleanup easy. It also prevents surface water penetration, making it great for use in tile applications requiring sanitary cove base like commercial kitchens, food processing plants, and bathrooms. Profile Heights: 5/16", 3/8", 1/2", 9/16"
Profile Sizes: 5/16" x 98.5", 3/8" x 98.5", 1/2" x 98.5", 9/16" x 98.5"
Easy to clean with common household cleaning agents. Do not use abrasive cleaners. Profiles Size Options: 5/16" x 98.5", 3/8" x 98.5", 1/2" x 98.5", 9/16" x 98.5"
Schluter®- DILEX-AHK cove-shaped profile features a single trapezoid-perforated anchoring leg. Designed for use in transitions with limited movement like inside wall corners, countertops, backsplashes, and floor/wall transitions. Available in anodized aluminum or textured color-coated aluminum in 14 finishes, to fit your design needs. DILEX-AHK has a 3/8" radius to prevent accumulation of dirt, making cleanup easy.